It was a year ago this week that I set my mind to learning better crochet skills. 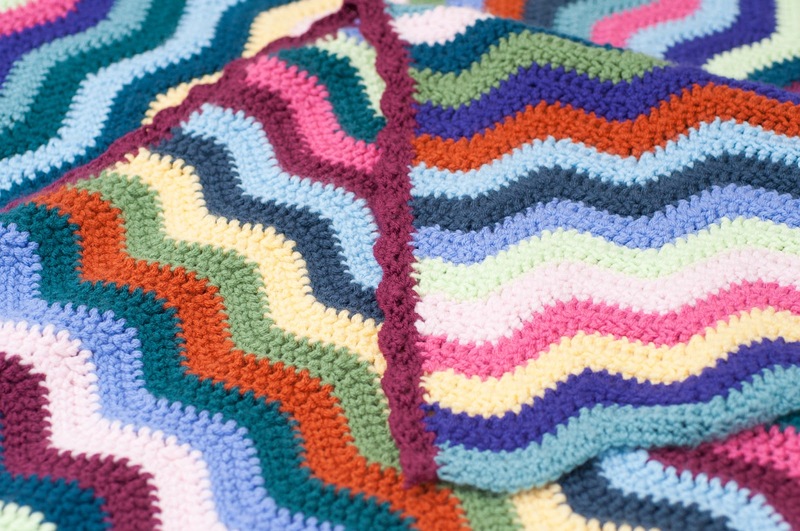 I had been crocheting since I was a child, but only knew how to make chains and (US) single and double crochet stitches and could only create solid, flat pieces like scarves or small blankets. I also vaguely knew how to make a shell border around a piece. 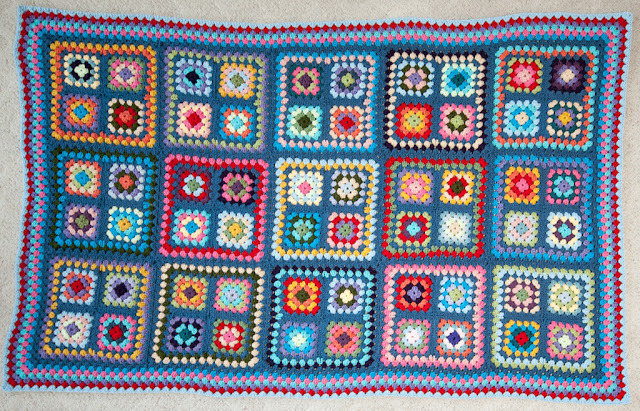 I had made a baby blanket when I was pregnant with the LB and had more recently been creating tiny doll blankets for the GB to play with. I mentioned to friends on Facebook that I felt ready to learn how to do more, and one friend suggested that I take a look at Lucy's blog, Attic 24. As I've said before, I started reading her blog and couldn't stop; I read it straight through, back to her first post, over the course of about a week. I decided to learn more from her tutorials because they are so easy to understand. I started my first Lucy-inspired project a year ago today. 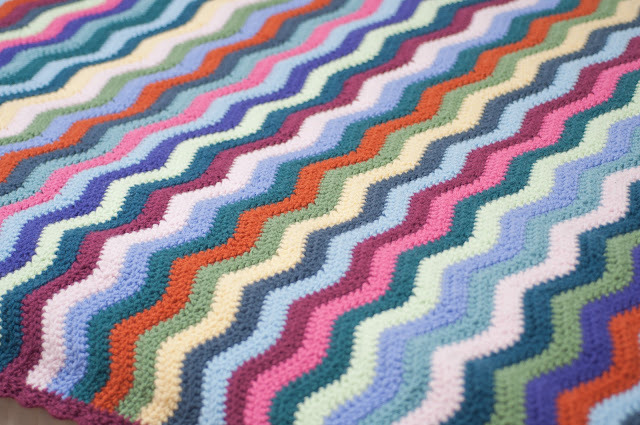 It was an afghan using her Neat Ripple Pattern. This was by far the most complicated crochet project I had ever tried and I worked so hard at it. I spent a morning teaching myself the pattern and went out the next day for yarn. 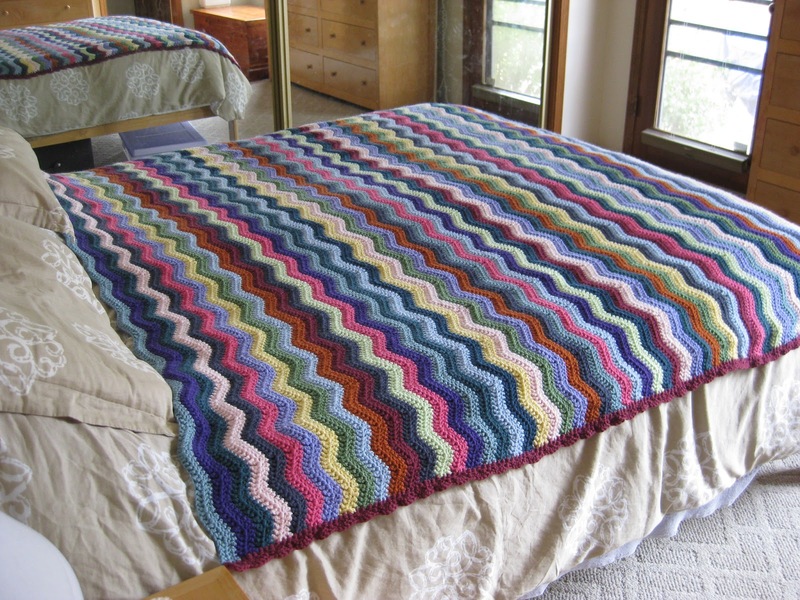 I used Hobby Lobby's I Love This Yarn worsted acrylic, in about 15 colors. 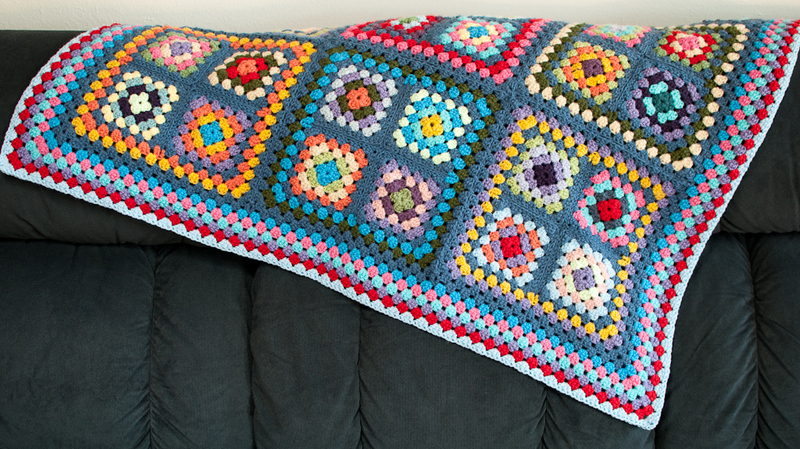 I wanted to make this blanket in a bright, eclectic way, just like Lucy's work. Hers was the first I'd ever seen which used such colors. I was mostly successful with this project. I lost count of my stitches numerous times and did much ripping-back. I also didn't really know how to hold the yarn properly yet, and my tension was a little wonky here and there. And my color choices needed some work. But all in all, I felt good about this project. I even added a shell border to two sides of the blanket. The one thing I just couldn't bring myself to do was use true red yarn! I used a burgundy/cranberry color instead. Red seemed too bold and daring for me at the time. I was happy with the blanket overall. I put it on our bed to brighten up the boring beige duvet we had then. 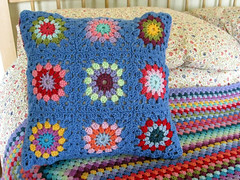 After I had made this blanket, I wanted to try other things from Lucy's blog, like her crocheted bag, which I could use as a yarn bag while I worked on a project. 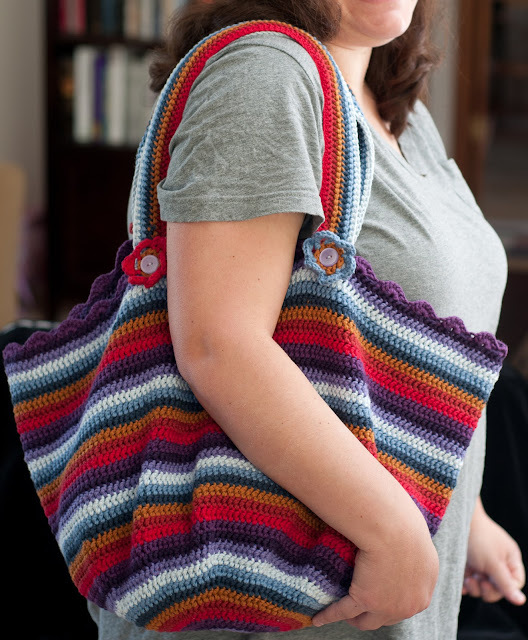 I made my bag and have been using it for holding yarn ever since. I wasn't very clear on how to finish a round of stitches and my bag got wider as it grew but it still works fine for holding yarn. This time, I did use some true red yarn and I was hooked after that...hee hee. I liked my bag so much that I decided to make a smaller version of it for the GB, to use for her dance classes. In between classes, she keeps her ballet slippers, tights and leotard in it, hanging from her closet door. During class, we put her clothes in it. She carries her slippers to and from class in it too. This bag is a little fancier because I lined it with fabric, to make it sturdier and to protect the yarn from snagging on the inside. 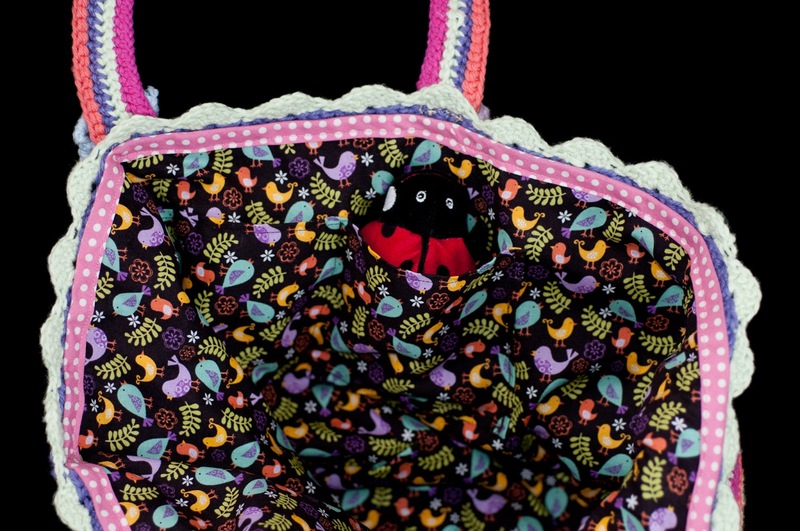 I used girlier colors for her bag, along with bird-printed fabric she helped me pick out and homemade bias tape as trim. I added a double pocket on the inside too. The doll in the above picture is wrapped in one of my earlier crocheted doll blankets with a weird, crinkly invented-by-me trim. I had come a pretty long way already. 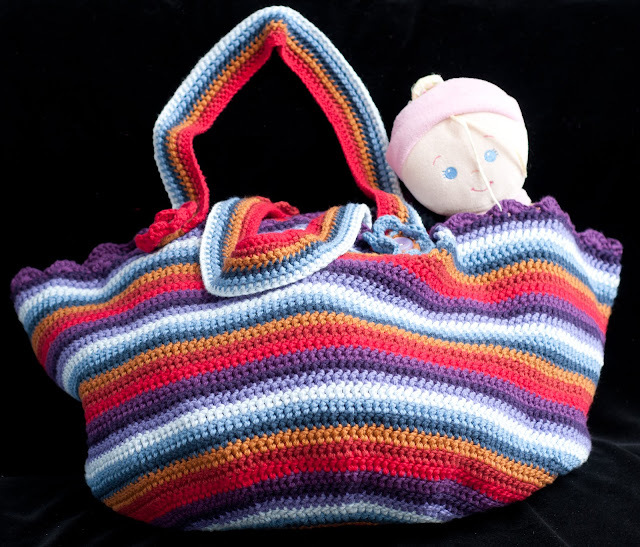 Both of these bags were made with cotton yarn, which was completely new to me. 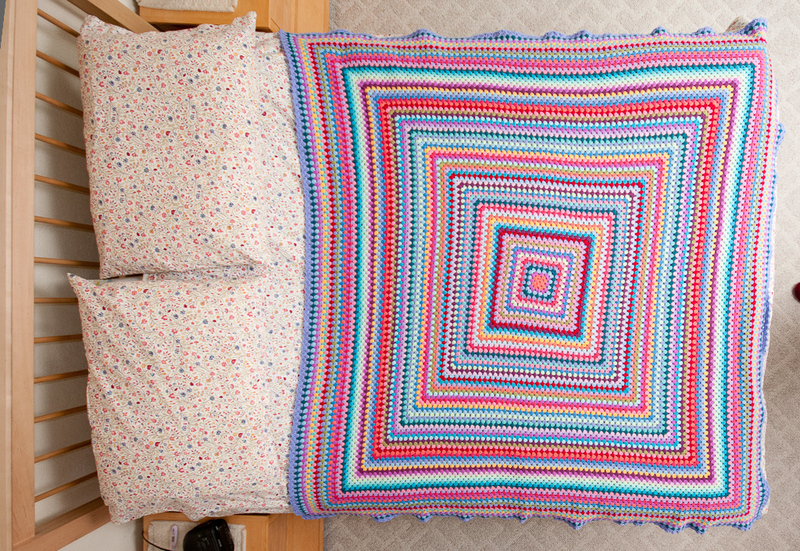 I wanted to try another blanket next, and ended up making my Giant Granny Square, which replaced the Ripple afghan on our bed when it was done. The Ripple was moved to the family room for everyone to use. The Giant Granny Square was made with my beloved Stylecraft Special DK; who knew that I could order massive quantities of great yarn from the UK for so little money? I think this is one of the best-kept secrets in crafting, personally. I learned about it on Ravelry, which I joined last spring when I got serious about learning more crocheting skills. 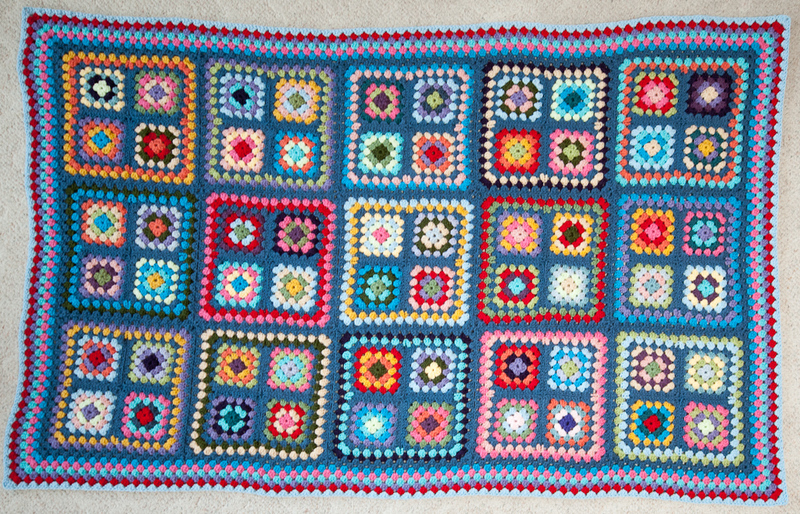 The Giant Granny is based on patterns from the Bunny Mummy blog; I used Jacquie's excellent granny square and Double V edging tutorials for this blanket. As you can see, I had also gotten a new duvet cover by now. I had learned so much about embracing color and choosing designs and patterns you truly love, as opposed to picking bland, neutral things to be safe. I'd always love color and bold designs but I didn't know how to use them. I credit Lucy, as well as other bloggers and style websites and Ravelry people, for my forays into bolder decorating. I realize now that it's wonderful to make my home bright and cheerful and happy with colors and handmade things, and to be proud of all of it. There's no reason to hide those feelings and interests. After I finished the Giant Granny, I felt ready to try a traditional granny afghan, to use in the family room along with the Ripple. This was my most recent blanket, unveiled in this post two weeks ago. I've been more and more happy with it all the time. Last night, I lounged under it while the Bear and I watched a movie and thought with pride how I could not have made something like that a year ago. The bright colors and eclectic look of it suit me very well, and I'm glad I have learned how to embrace that with pride and happiness, instead of pretending I liked boring things better. In between these larger projects, I crocheted smaller things too, including a table runner, a hat for the GB, a scarf for my Ravelry swap partner, a garland of crocheted hearts (which hangs in the GB's bedroom), stuffed hanging heart decorations and numerous jar jackets. I also made some items for charity, including chemo caps for women battling cancer and hat-and-blanket sets for premature babies and deceased newborns. It felt good to make all of these things, some to make people happy and some to offer comfort to people in need. I enjoyed having this new skill which I could use to create so many different kinds of things, both decorative and useful. Now I'm working on some new things. I have a few patterns in mind to make gifts for teachers and possibly my mom's Mother's Day gift, as well as a baby blanket for an expecting friend. I really love that I have developed the skills to pick up my hook and yarn and start making something right away. 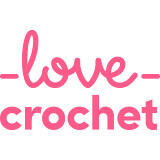 I really like that I can read a crochet pattern and know what all the abbreviations mean. These are not skills I ever expected to have and I'm very happy to have set my mind to learning them. I am also very appreciative to all the bloggers and Ravelry members (some of whom are also bloggers) who have made it easier to learn with their tutorials and helpful advice. I have decided that with a year of serious crochet under my belt, I am going to allow myself to use nicer yarn for my projects from now on. Stylecraft Special DK is still a-okay with me; in fact, I just placed an order with Deramores last week. The very cheap yarns were excellent for learning with but I want to enjoy my projects as much as possible. I don't want to become a snob about it, and I really won't, since I can't spend endless amounts of money on crafting. But I think I may slow down my creation slightly so that I can savor my work more and then I will also be able to spend more on an individual project's yarn supplies. I would really like to learn more techniques for making wearable items, which helps guide this choice too. One unexpected benefit of my crochet awakening has been to help me stop biting my fingernails. I had been a lifelong nail-biter before last year; I honestly do not remember starting to bite them, so I must have been very young when I did. I have struggled with some anxiety issues all of my life too, and I took them out on my fingernails. Crocheting has given me an excellent tool for dealing with anxiety. I have felt my entire life become calmer and more peaceful. My mind doesn't race with worries the way it used to. I am happier through and through. And my hands look pretty for the first time in my life. I have even bought myself some nail polish, which I never had a reason to do before. I've also discovered such a wonderful community in Blogland. I had always consulted blogs for tips and ideas, especially for cooking, but I didn't read very many habitually. But now, I check in every day on the blogs I enjoy and I have met so many interesting people and learned many new things. I even started my own blog! Well, you knew that. I felt inspired because I could see that people were really enjoying themselves with their blogging. I felt for the first time that I, too, might have things to say and to share which would interest people and help me to appreciate and enjoy my life more. It's definitely working. I think your work is spectacular. It's the colors you choose and the contrast between lights and darks and "mediums" that make eveyrthing so special. 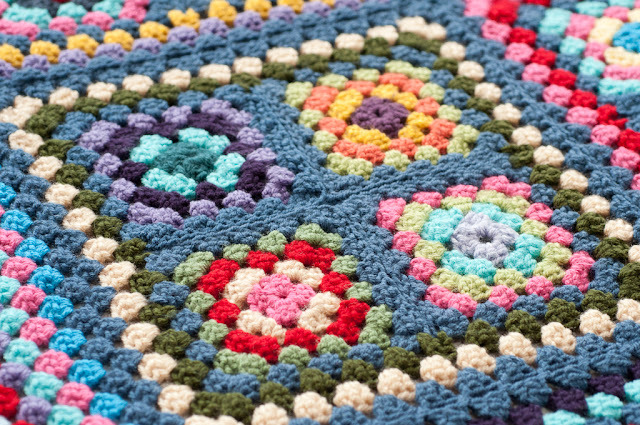 That granny square is the prettiest one I've ever seen! 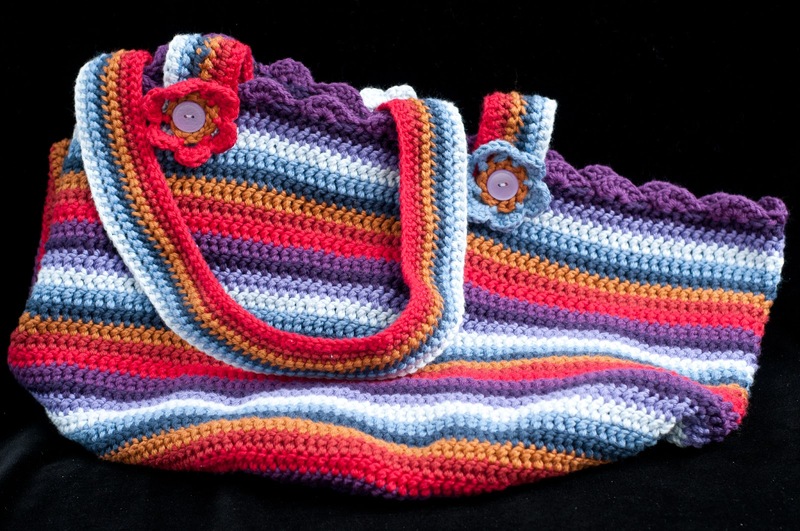 I love the crocheted bag! You are so clever! but enjoy. My blog just turned one and amazed at what I have made. Im really impressed with your creations ! Stunning work and such result ! So pleasant to pop over your blog ! What a fabulous post! All your blankets are beautiful but I am very in awe of your bags - I am still a beginner crocheter and I think it will be some time before I attempt something like that. Yay for embracing your love of colour! I'm really impressed with your blankets! You have a great eye for color combinations. These are all stunning. 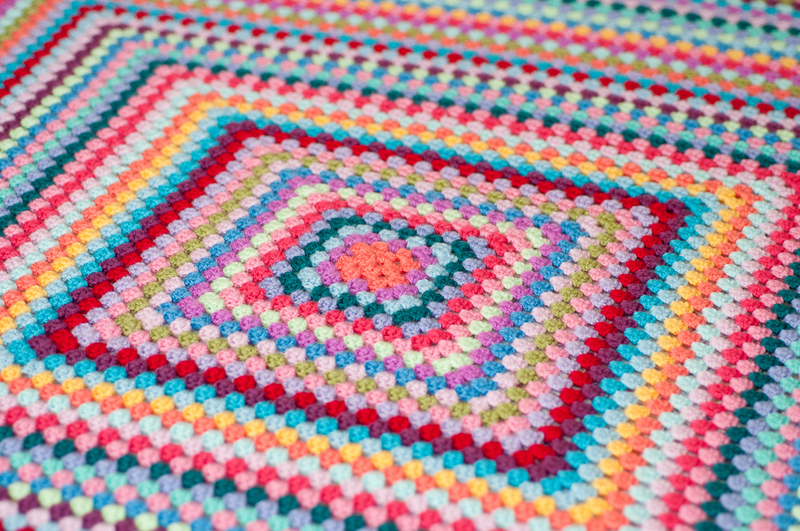 I very much enjoyed your crochet post! All your different makes are just lovely, you have a great eye for colour. 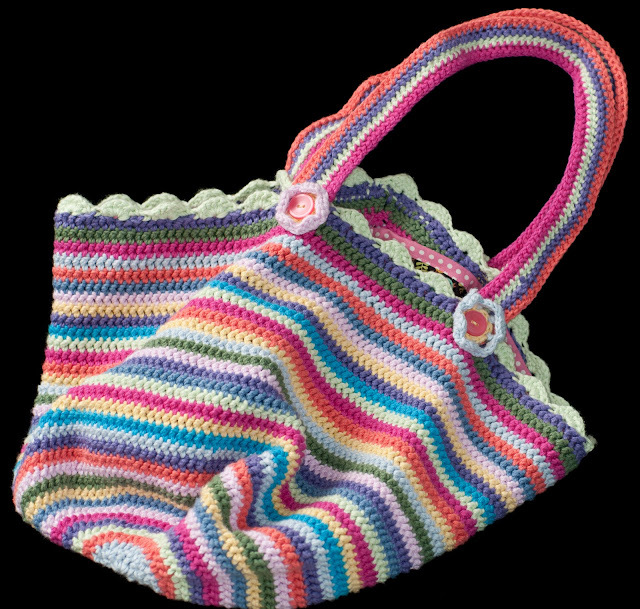 I also love Stylecraft Special DK yarn, I think it's fantastic to crochet with. I know what you mean about blogs too, I am so loving being part of this fantastic community. Everything you've done has been so beautiful - I think you're a natural. I was a lifelong nail biter too until just a few years ago (I still slip up and occasionally chew one tot he quick). I'd tried to quit all my life but never could. I went on some anti-anxiety medicine a few years ago and I wonder if that's what did it. I find that when I tend to chew them now is when I watch intense movies - I think that's where crocheting really helps. I often work on a project while I'm watching and that keeps my fingers occupied. I love the blankets. This might be the year that I tackle a ripple blanket. 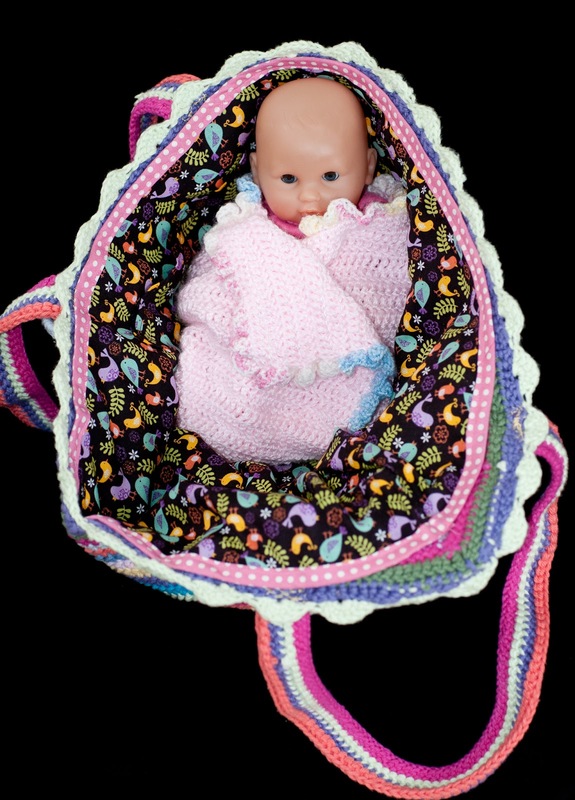 What lovely blankets and bags. It was through Lucy's blog and tutorials that I learned to crochet properly (my grandmother taught me the basic stitches when I was young, but I never got much further than that). I've got a huge box of acrylic DK yarns now and can't decide what type of blanket to make next, a colourful granny square, or a patchwork, single-coloured squares one. Wow, those are some great projects! Thanks so much for stopping by my blog. I don't have your email address but wanted to reply to your comment. Feel free to toss me an email at knitpurlmama at gmail dot com with your email address and I'll reply. Have a great weekend. Just stopping by from the blog hop. Hi, I am writing to you from South Africa. 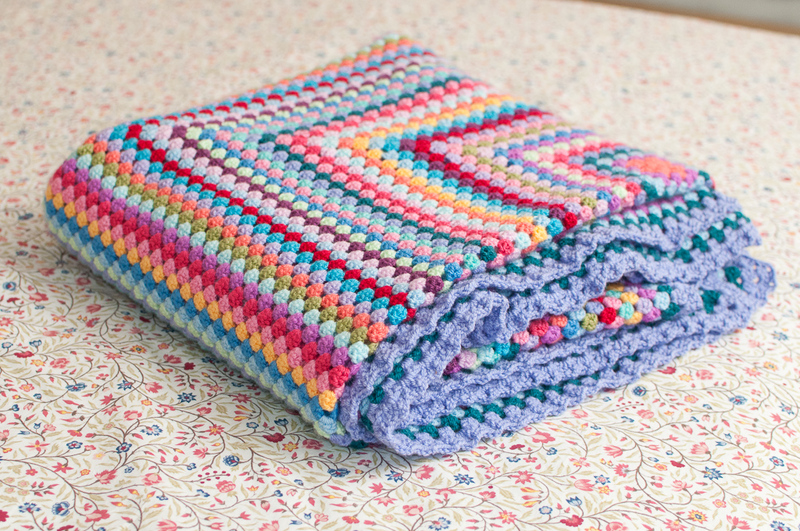 I love your colour choices which make your blanket/throws very pleasing to the eye. i.e. 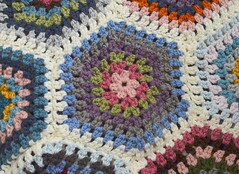 the Granny Squares. You have inspired me to use up all my bits of wool and make something as beautiful with them. Keep crocheting - crochet is back in fashion.